Note: If you decided on extended withholding tax and activate this procedure, you must migrate your master data and transaction data. You cannot then return to the original withholding tax procedure afterwards. With extended withholding tax, you can process withholding tax from both the vendor and customer view. In Accounts Payable, the vendor is the person subject to tax, and the company code is obligated to deduct withholding tax and pay this over to the tax authorities on the vendor’s behalf. In Accounts Receivable, the company code itself is subject to tax, and the customers that do business with this company code deduct withholding tax and pay this over to the tax authorities on the company code’s behalf. In both cases, the business partner of the person/entity subject to tax deducts the tax and pays it over to the tax authorities. Withholding tax is calculated and posted to the appropriate withholding tax accounts at different stages, depending on the legal requirements in each country. As a rule, withholding tax is posted at the same time that the payment is posted, in other words the outgoing payment (Accounts Payable) or incoming payment (Accounts Receivable), is reduced by the withholding tax amount. In certain countries, such as Brazil, the Philippines, and Spain, withholding tax can or must be posted when the invoice is posted. This means that the amount receivable or payable is reduced by the withholding tax amount. Extended withholding tax supports both concepts. The key concept in extended withholding tax is the distinction between withholding tax type and withholding tax code. While withholding tax types represent basic calculation rules, specific features of these rules - in particular the percentage rates - are represented by the withholding tax code. You can define any number of withholding tax codes for a given withholding tax type. If a particular transaction requires more than one kind of withholding tax, this is covered in the SAP System by defining more than one withholding tax type. When entering a line item, you can enter withholding tax data for each of these withholding tax types. a). Official With holding Tax Code/Key : It is Variant identify the different withholding tax types, you can define these official names for your tax codes here like for TDS we may define Sec.194c, Sec.194J, Sec194I etc. c). Recipient Types: Means a group of vendor or customer to which different tax code and tax types will be defined. For example for TDS we may define Company and other then company. e). Business Place means an organization units for tax purpose , for example for income tax we define income tax commissioner as business place . g). Withholding Tax base amount is the gross amount upon which tax rate is applied. h). Withholding tax type this is the broad nature of tax category defined according tax laws for example income tax, sales tax. i). Number Class : Number class is a variant that controls number group and number ranges for tax certificates . number class is defined per tax types. In order to be able to use extended withholding tax, you must make various settings in Customizing and the master data of the business partners concerned in each of the company codes. Activate extended withholding tax To be able to use extended withholding tax, you must first activate it. For more information, see the Implementation Guide (IMG) for Financial Accounting ->Financial Accounting Global Settings -> Company Code -> Activate Extended Withholding Tax. Settings -> Withholding Tax -> Extended Withholding Tax -> Basic Settings…………. withholding tax keys, and reasons for exemption. forms for reporting the tax. For more information on reporting withholding tax, see FI - Closing and Reporting. Define the name of the withholding tax type. Define the details for calculating the withholding tax base amounts and the rounding rules for the withholding tax amount. You also determine whether the withholding tax amount is to be both calculated and posted or only calculated (the latter is the case in France, for example). Net amount The withholding tax base amount is the line item net amount. Define Transaction Key for Modified Net Amount. Gross amount The withholding tax base amount equals the line item gross amount. Tax amount The withholding tax base amount equals the tax amount of the line item. specified for this withholding tax type in a separate activity in Customizing. You can define dependencies between withholding tax types via the fields Reduced base amount or Inherit base. 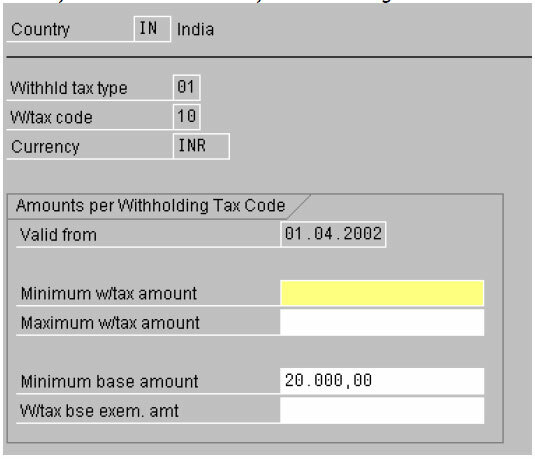 If the field Reduce base is selected in a withholding tax type, the withholding tax base amount is reduced by the withholding tax amount of the dependent type. Alternatively, you can select the field Inherit base. The withholding tax base amount then corresponds to the withholding tax amount of the dependent type. 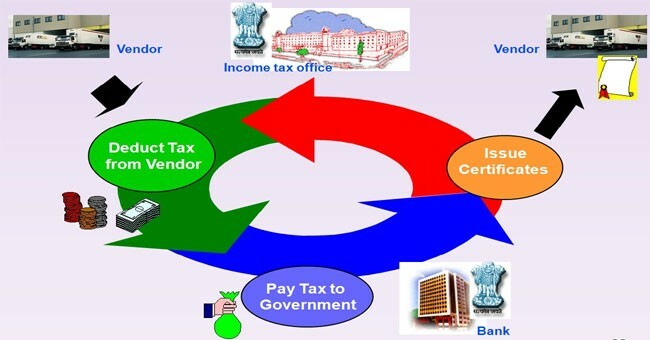 You define the dependency between two withholding tax types in a separate activity in the Implementation Guide -> Financial Accounting -> Financial Accounting Global Settings ->Withholding Tax -> Extended Withholding Tax -> Calculation -> Withholding Tax Base amount -> Portray Dependencies between Withholding Tax Types. The final amount used for the withholding tax calculation is calculated by applying the proportion subject to tax (defined in the withholding tax code) to the base amount defined here in the withholding tax type. Furthermore, you can round withholding tax amounts according to the first decimal place for example, or you can apply rounding to amounts without decimal places. You define these rules in a separate activity in the Implementation Guide -> Financial Accounting -> Financial Accounting Global Settings -> Withholding Tax -> Extended Withholding Tax -> Calculation -> Withholding Tax Type -> Define Rounding Rules for Withholding Tax Types. Here you define whether withholding tax base amounts and withholding tax amounts should be accumulated for this withholding tax type, and if so, for what period. If the law permits withholding tax exempt amounts over a specific time period (for example, monthly, annually), the amounts posted in this period must be retained. This ensures that withholding tax is posted as soon as the exempt amount is exceeded. In the SAP System, this is reflected by accumulation. You can accumulate amounts for calendar years, quarters, or months. Since with accumulation, accumulated amounts are already included in the calculation of the withholding tax amounts for the current payment in the period, the accumulation cannot be used for summation. If you have activated accumulation for a withholding tax type, the accumulated withholding tax base amount in the current period (month, quarter, year) is added to the withholding tax base amount of the line item for which the withholding tax amount is to be calculated. The withholding tax amount is determined by applying the withholding tax rate or formula (scale) to this total, and subtracting the withholding tax amount accumulated in the period concerned. A formula is a series of staggered withholding tax rates valid for different withholding tax base amount intervals. The current withholding tax base amount and the tax amount itself are added to the corresponding values in the accumulation table. Accumulation is entered per customer/vendor account, withholding tax type, and withholding tax code in the local currency of the company code concerned. To prevent a withholding tax posting as soon as the accumulated withholding tax amount exceeds a defined maximum, select the field Acc. w/tax to max. Here you define whether manually entering the withholding tax base amount or the withholding tax amount is permitted during document entry whether you want to suppress withholding tax certificate numbering. You can enter regional codes here. The regional code ensures that the withholding tax is reported and paid to the relevant tax authorities. Here you define whether you want to maintain minimum and maximum amounts at withholding tax type level or withholding tax code level. Here you can also select combined accumulation if amounts are to be accumulated over several vendors or customers. This means that self-withholding is permitted for this withholding tax type (that is, vendors subject to tax can pay over the tax themselves). Here you enter a withholding tax amount that has already been withheld (for example, by a subcompany); this amount is then deducted from the calculated withholding tax amount on payment (only possible with No accumulation and Central invoice proportion.). Here you can enter the withholding tax amount manually for incoming and outgoing payments for this withholding tax type. The central invoice function is a special procedure for calculating withholding tax that is used in Argentina. Invoices and debit/credit memos that are linked via the field Invoice reference are processed separately. The central invoice entry method is not used for this withholding tax type. If you use this withholding tax type, the whole withholding tax amount is posted when the first partial payment is made for the open item. This function is used to calculate the withholding tax based on tax on sales/purchases (Sales Tax Withholding) in Argentina. The withholding tax base amount is compared to the minimum amount using the total amount of the withholding tax base amounts of the open item together with the related documents, whether or not these were previously selected. The withholding tax amount is distributed across all partial payments in proportion to the payment amount in the open items. In Argentina, this function is used to calculate withholding tax on income tax and social insurance tax. Here you define at what level - invoice or payment - minimum checks are carried out. The specification is valid either for the minimum base amount check or the minimum amount check. If you select Minimum check at item level, the minimum amount check and withholding tax amount check is carried out for each item to be cleared. If you select Minimum base amount check at payment document level, the system uses the full withholding tax base amount for all items as the basis for the payment proposal for the relevant payment. The minimum base amount is then checked against this total withholding tax base amount. This function is used in Argentina to calculate withholding tax on income tax. If you select Minimum base amount check at invoice document level, when you pay a given invoice item, the system calculates the amount for the minimum base amount check using the total of all items in the invoice. The minimum base amount is then checked against this total withholding tax base amount. If you select Minimum amount check at payment document level, the system uses the full withholding tax amount for all items as the basis for the payment proposal for the relevant payment. The minimum amount is then checked against this total withholding tax amount. You define the tax base and rate in the withholding tax code. You make the settings for each country and withholding tax type. You can therefore define as many withholding tax codes as required for each withholding tax type. Define the description of the withholding tax code, and where necessary, the official withholding tax key. Official withholding tax keys are used on official forms when reporting taxes, You define the official withholding tax key in a separate section of the Implementation Guide for Financial Accounting: Financial Accounting Global Settings -> Withholding Tax -> Extended Withholding Tax -> Basic Settings -> Define Official Withholding Tax Keys. Define the portion to be taxed. This percentage rate is used to determine the final withholding tax base amount and is applied to the withholding tax base amount calculated as a result of the setting in the withholding tax type. line item for the withholding tax. tax code. The system creates two withholding tax line items with opposing debit/credit signs. Define the withholding tax rate or the information for using calculation scales (formulas). For the withholding tax rate, you can enter either a percentage rate between 0 and 100, or you can enter a fraction. The system then uses this rate to calculate the withholding tax amount from the withholding tax base amount. If you set the indicator Withholding Tax Formulas, the system calculates the withholding tax amount from the withholding tax base amount using one of the scales defined for this withholding tax type/code combination. You define the withholding tax scales in a separate activity in the Implementation Guide for Financial Accounting: Financial Accounting Global Settings -> Withholding Tax -> Extended Withholding Tax -> Calculation -> Withholding Tax Codes -> Define Formulas for Withholding Tax Calculation.All calculations are made in the respective local currency. This means that you have to maintain the minimum and maximum for the withholding tax amount, the minimum base amount, the withholding tax exempt base amount, and the scales in the local currency of the company code. Where necessary, define the region, the provincial code, and the type of income. If the legal requirements permit minimum, maximum, or exempt amounts for the withholding tax base amount or the withholding tax amount, you can define these here. All calculations are made in the respective local currency. This means that you have to maintain the minimum and maximum for the withholding tax amount, the minimum base amount, the withholding tax exempt base amount, and the withholding tax scales in the local currency of the company code. You can define the minimum and maximum amounts at one of two levels, depending on the setting on the corresponding withholding tax type for base amounts or withholding tax amounts . If the withholding tax amount calculated is lower than the minimum amount you specify here, then the system calculates the withholding tax amount as being zero. If the withholding tax amount calculated is higher than the withholding tax maximum amount you specify here, then the system uses this maximum amount in the withholding tax calculation. If the withholding tax base amount is lower than the minimum base amount you specify here, then the system calculates the withholding tax amount as being zero. If the withholding tax base amount exceeds the minimum base amount specified here, the system uses the whole base amount to calculate the withholding tax (compare Withholding tax base exempt amount). If the withholding tax base amount is lower than the withholding tax base exempt amount, then the system calculates the withholding tax amount as being zero. If the withholding tax base amount exceeds the withholding tax base exempt amount specified here, then the system uses the base amount as reduced by the exempt amount for the withholding tax calculation. For accumulation, the total accumulated base amount is checked against the minimum base amount or the withholding tax base exempt amount. In contrast, the withholding tax amount as reduced by the values already accumulated is checked against the withholding tax minimum amount or the withholding tax maximum amount. You define accounts for the account determination for posting withholding tax. In the Implementation Guide -> Financial Accounting->Choose Financial Accounting Global Settings-> Withholding Tax -> Extended Withholding Tax -> Postings -> Accounts for Withholding Tax . Here you define accounts for the normal withholding tax transaction (WIT). This transaction is required for every withholding tax posting. You define accounts here if you have selected value 2 for the posting indicator in the withholding tax code. An offsetting posting with the opposite +/- sign is then carried out for the withholding tax item (transaction GRU). The withholding tax amount is increased by a factor of 1/(1-p). You define accounts here if you have selected value 3 for the posting indicator in the withholding tax code. An offsetting posting with the opposite +/- sign is then carried out for the withholding tax item (transaction OFF). You define accounts here if you want to post self-withholding tax. An offsetting posting with the opposite +/- sign is then carried out for the withholding tax item (transaction OPO). Path : Implementation Guide for Financial Accounting: Financial Accounting Global Settings -> Withholding Tax -> Extended Withholding Tax -> Company Code -> Assign Withholding Tax Types to Company Codes. Withholding tax is only posted for a withholding tax type if the vendor is defined as subject to tax for this withholding tax type, and the customer is defined as authorized to deduct tax for this type. Each withholding tax type assigned to a company code must have been defined for the country of the company code. The following differences apply to vendor and customer business transactions. and the vendor must be subject to withholding tax. 1. Validity Period : You specify whether and for how long the company code is authorized to deduct withholding tax for the specified withholding tax type. In order to post withholding tax in customer business transactions, the company code must be subject to withholding tax for the type concerned, and the customer must be authorized to deduct withholding tax. 1. Similarly, for Accounts Receivable, you specify whether the company code is subject to withholding tax or if it is authorized for self-withholding tax. If necessary, you can also enter details concerning withholding tax exemption. Define the customer as being authorized to deduct withholding tax and define the validity period for the authorization. If necessary, also define the withholding tax code and the withholding tax ID. The withholding tax type is entered in the master record of the business partner and defined as subject to withholding tax (vendor) or entitled to deduct withholding tax (customer). For this withholding tax type, the company code is defined as entitled to deduct withholding tax for vendors, and subject to withholding tax for customers. The posting date is within the validity period for the deduction authorization (customer master record or withholding tax data for the company code). Due to the validity periods that you have to define, the withholding tax master data is timedependent. This means that the withholding tax information saved in an open item may be different to the current relevant withholding tax types. 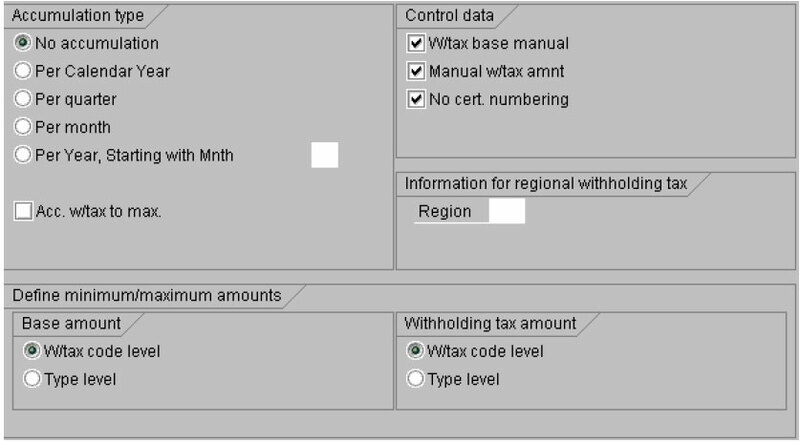 In the document display, the system displays appropriate warnings about the validity of the withholding tax information in the withholding tax dialog box. If, between the time a document is entered and the time it is cleared, you have changed the list of relevant withholding tax types, the system will not clear the document. This is the case where the company code is no longer authorized to deduct tax for a withholding tax type, although it was authorized to do so at the time the document was entered. 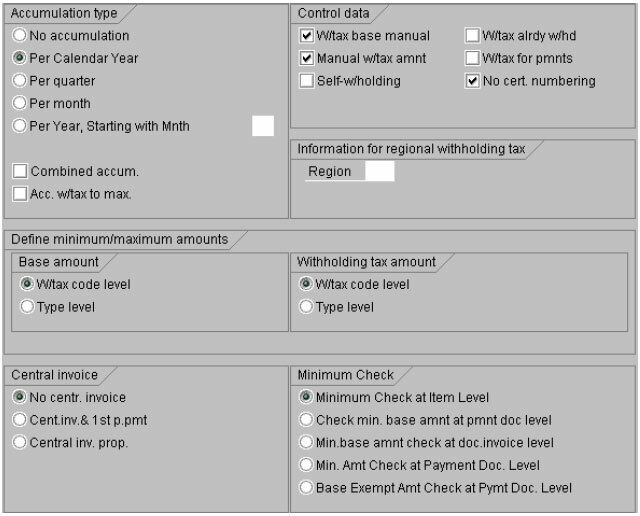 The item in question is displayed in the withholding tax dialog box with all the withholding tax data stored in the database. The system displays a message telling you that this withholding tax type is no longer relevant. Change the posting date for clearing, so that the relevant withholding tax types are the same on the posting date and on document entry. Change individual documents using the document change function: To do this, you delete the withholding tax code in withholding tax types that are no longer relevant, and then save new withholding tax types. Once you have changed the relevant withholding tax types, this report adjusts the open items to take account of the current relevant withholding tax types. It either creates new withholding tax information, or changes existing information. Withholding tax certificates are proof for the vendor and the tax authorities that tax was withheld. In certain countries, such as Argentina, it is a legal requirement that withholding tax certificates are numbered clearly and consecutively. To be able to exercise as much control as possible over the way withholding tax certificates are numbered, the SAP System offers you a range of numbering methods, of which three are currently available. You can assign one of these methods to any given country. Each number is taken in sequence from a number range interval assigned to a numbering group. The numbering groups are assigned to numbering classes. The number is then determined according to the numbering class the method is assigned to. Global Settings -> Withholding Tax -> Extended Withholding Tax -> Postings -> Certificate Numbering for Withholding Tax. 4. Choose a suitable numbering method and assign it to your company code country. 5. Define numbering classes, for example, one class per withholding tax type used. 6. Assign numbering groups to the numbering classes. In this activity, you specify the company code and numbering class. When you save the data, the system creates the numbering group and assigns it to a numbering class automatically. 7. Assign your numbering classes in accordance with the numbering method chosen. Withholding tax is taken into account in all normal posting transactions. The withholding tax information must therefore be entered here. The field status for document entry must be defined in such a way as to allow withholding tax data to be entered in at least one withholding tax field. You must select at least one withholding tax type. For more information about the relevance of withholding tax types, see Defining Liability to Tax and Deduction Authorization. When entering documents, you can enter withholding tax data for every customer/vendor line item. Once you have confirmed entry of the line item (on the customer or vendor screen), the system displays the dialog box Enter Withholding Tax Information which contains one line per withholding tax type. During document entry, this withholding tax dialog box appears each time you create a new customer or vendor line item. If you edit one of these customer or vendor line items again during document entry, you will need to access the withholding tax dialog box by choosing Extras -> Withholding tax data . 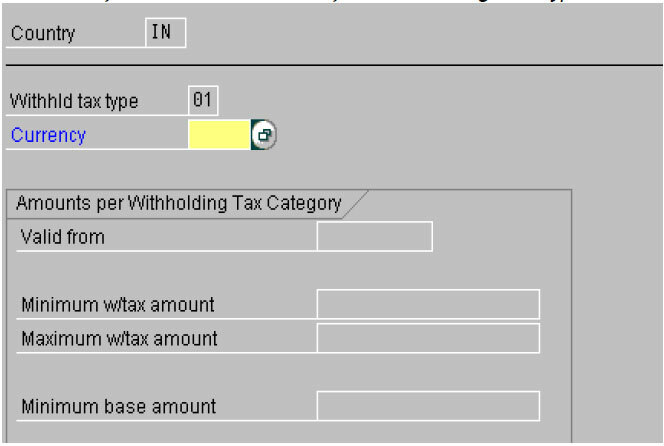 You determine the status of the fields W/tax b/at (withholding tax base amount) and W/tax amnt (withholding tax amount) displayed in the withholding tax dialog box when defining the withholding tax type. an entry for withholding tax once you simulate the document. The base amount can also be entered manually by the user (if the relevant Customizing settings have been made), and a manual entry overrides the amount calculated by the system. Where payments are made by installments, the withholding tax base is apportioned across the new customer/vendor line items. Calculation of the withholding tax amount The way in which withholding tax is calculated depends on the withholding tax type: The withholding tax type controls when the withholding tax is calculated and posted for example. Withholding tax is calculated and posted either when the invoice is entered or when payment is made. Withholding tax is generally calculated by the system. However, if you have made the appropriate settings in Customizing, it can be entered manually. 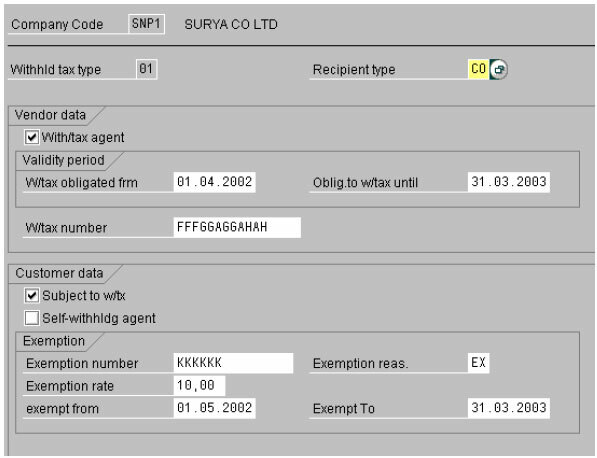 A manual entry overrides the amount calculated by the system. When you post down payment requests and payment requests, the system only calculates the withholding tax base amounts. The system does not calculate any withholding tax base amounts when you save or change parked documents, only when they are posted. When documents are held, the system does not calculate any withholding tax amounts/base amounts. When you post documents using a reference, the system defaults withholding tax base amounts, but not any existing withholding tax amounts. The system does not calculate any withholding tax base amounts/tax amounts when you enter a reference document. The system does not calculate any withholding tax base amounts/tax amounts when you enter a recurring entry document. Provided you have not already posted the withholding tax, you can change the withholding tax information in a document. This is only the case for withholding tax of the type posting at time of payment. You can only make changes however in transactions that are not relevant for payments. 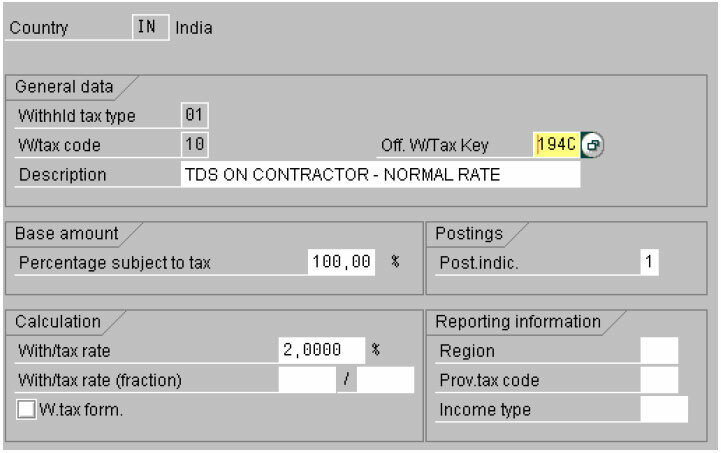 When you change the document, the system enables you to change the selection date in the withholding tax dialog box. If you have made changes in the relevant withholding tax types, the withholding tax fields for this type are ready for input. The settings you made in Customizing for the withholding tax type in question determine whether the amount fields such as Withholding tax base, Withholding tax amount, and Withholding tax amount already withheld can be changed or not. If you enter a new withholding tax code and do not enter the withholding tax base amount manually, the system recalculates the withholding tax base amount automatically. If you delete the withholding tax code, the system resets all withholding tax information for this withholding tax type. Whenever you change withholding tax information, the system creates change documents. The same rules apply for displaying documents as for changing them, with the exception that you cannot enter any data in the fields. If, for example, when displaying the document, the list of relevant withholding tax types differs from the withholding tax types already defined in the withholding tax information for a line item, the same rules apply as for changing documents. When displaying documents, you can display the withholding tax base amount and withholding tax amount in all the currencies maintained for that company code. 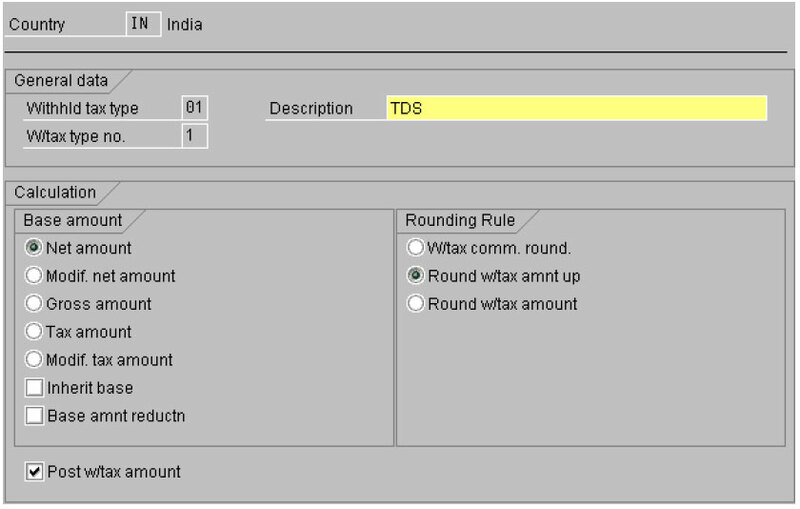 You can call up the various currencies in the withholding tax dialog box by choosing the appropriate pushbutton. For withholding tax types with posting at time of payment, the withholding tax is calculated and posted when open items are paid. When you clear open items without a payment (transfer posting), no withholding tax is posted. If you select these functions, your selections are reset and the system displays an appropriate message. For postings with clearing, the system calculates and, if necessary, posts the withholding tax for the withholding tax types with Posting at time of payment. Any withholding tax amounts you may have entered manually override those calculated by the system. An open item can only be activated if, at the time it is cleared, the withholding tax information it contains is still relevant. This will depend on the date the document was entered and the posting date of the payment. For more information about the relevance of withholding tax types, see Defining Liability to Tax and Deduction Authorization. If an open item is not active, all withholding tax amounts are zero. If you recalculate the withholding tax amounts for an active open item, these amounts can change due to the Customizing settings for withholding tax types. This may be the case, for example, if you have defined withholding tax after cash discount or accumulation for this withholding tax type. The total of withholding tax amounts for all open items is displayed in the appropriate field in the lower half of the withholding tax screen. The system takes this figure into account when determining the total amount to be cleared. Note however that this total amount does not include withholding tax amounts posted as Offsetting entry to G/L account/No reduction in subledger, Self-withholding or Offsetting entry to G/L account. When you post or simulate the payment document, the total withholding tax amounts are subtracted from the payment amount. The withholding tax amounts are posted to the G/L accounts specified in the account determination in Customizing for the withholding tax types/codes. Those withholding tax amounts posted as Offsetting entry to G/L account/No reduction in subledger, Self-withholding or Offsetting entry to G/L account do not reduce the payment amount, even though the system makes a posting to a withholding tax account. Instead of the payment line item being reduced, an offsetting entry is made to a G/L account in accordance with the account determination defined for the transaction key in question. The payment proposal includes information about potential inconsistencies in a business partner’s withholding tax status and in the open items. If the relevant withholding tax types for an open item are different to the relevant withholding tax types when the payment is posted, this is an inconsistency and the system adds these open items to the exception list. You have to change each document in the exception list individually. As is the case for manual payment transactions, the payment program also supports payment of withholding tax calculated for more than one document. In this case, the withholding tax amount is not calculated on a single line item but on all the selected line items linked by the invoice reference. With the exception of withholding tax types for which accumulation is active, this calculation method is restricted to open items cleared by a single payment document. When you call up the payment proposal, you can have the system recalculate the withholding tax at any time. When you save the proposal, the system always recalculates the withholding tax. When you call up the proposal, you can display the withholding tax data for every individual document. If the withholding tax amount withheld by your customer differs from the withholding tax amounts calculated by the system, you can enter and post the tax amount withheld by your customer manually in place of the amount calculated by the system. In the withholding tax dialog box, you can enter the tax amount withheld by your customer for every open item. 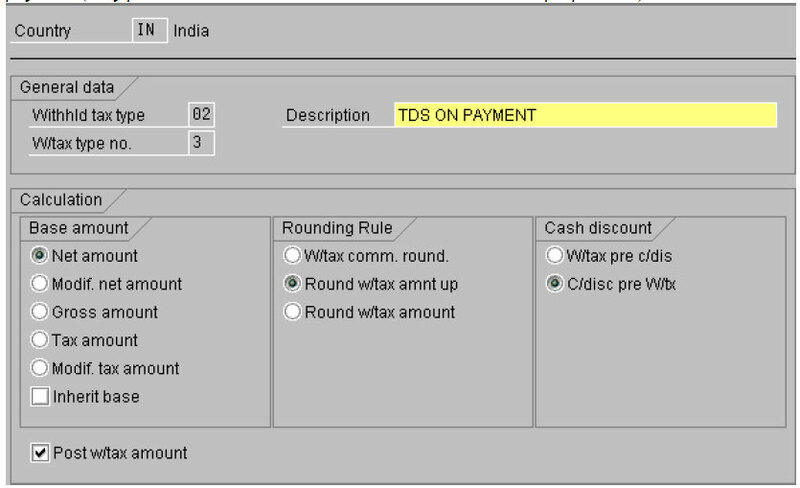 You can use this function for any withholding tax type (setting WT acc. to payment in withholding tax type); it is not dependent on the settings you made in Customizing for manual entry of withholding tax amounts during document entry (setting Manual w/tax amount in withholding tax type). If you enter withholding tax amounts in this way, the system posts them without checking these amounts. self-withholding if the field Calc. self-withholding is selected, or without self-withholding if the field is not selected.